If you arrive by car, mobile-home, motorbike or by public transports, there is always a possibility to come to Beaufort. Enter your departing point and Google Maps will help you. 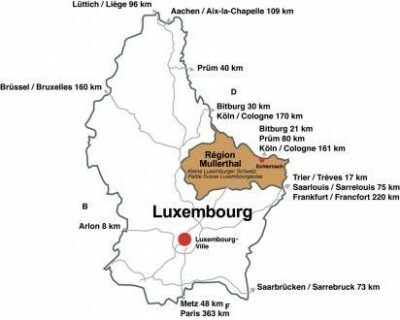 The official homepage of the Mullerthal Region – Luxembourg’s Little Switzerland and Lower Sure. Data base of images of the region. The official homepage of the National Tourist Office with important information about tourism in Luxembourg in general. The Ministry of Middle Classes, Tourism and Housing informs on this website about its missions, the structure in tourism and the recent development. Hiking and biking tours in Luxembourg. Official website of LEADER Mullerthal. website of the Ardennes of Luxemburg. The official website of the Luxembourgish railway company. Schedules and tariffs of public transportation. The “ Luxembourgish Bike Initiative” presents itself. Detailed map and description of the bike tracks. Official website of the German-Luxembourgish Nature park. The pharmacies and emergency services. The weather forecast for the Grand Duchy. Luxembourg presented in 10 different videoclips.